Nowhere in there do I see an exception for “conspiracy theories,” but apparently Constitutional scholar Barack Obama has an alternative interpretation. “That is hard to do, but I think it’s going to be necessary, it’s going to be possible,” he added. The above may sound good on a superficial level to people with zero critical thinking skills, but even the most elementary analysis exposes it as the obvious and dangerous attack on free speech that it is. Let’s zero in on a few things he said in closer detail. He describes the media environment as the “wild, wild west.” Kind of sounds like an environment in which people are free to say, publish or record whatever they want, and let the chips fall where they may. Seems consistent with the first amendment to me. Of course, the New York Times rendering judgment on those pushing conspiracy theories would be downright hilarious if it weren’t so sad. For example, the paper itself exhibited no such restraint when it came to peddling U.S. government conspiracies about Iraq in the run up to one of the most inhumane, unnecessary and destructive foreign policy blunders in American history. In fact, the paper was ultimately so embarrassed by its own behavior, it issued a statement in 2004 titled, FROM THE EDITORS; The Times and Iraq. Meanwhile, there were millions of people in the “wild west” of opinion making yelling and screaming that the government was misleading the public about Iraq in order to go to war. So who got it right, the New York Times, or the wild, wild west? If Obama had his way, those people who asserted that the public was being mislead into the Iraq war would have been dismissed as “conspiracy theorists” not worth paying attention to since they refused to agree with government “facts.” Obama’s position is such an obvious authoritarian slippery slope, one has to ask why he would dare go so far. Actually, what is happening now is that we are getting closer to the time of the coming ‘famine’ of the word of God. Various ones in the government of the USA are sadly helping set the stage for this. 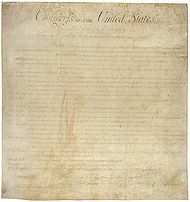 First amendment — Congress shall make no law respecting an establishment of religion, or prohibiting the free exercise thereof; or abridging the freedom of speech, or of the press; or the right of the people peaceably to assemble, and to petition the Government for a redress of grievances. While the USA is supposed to have freedom of speech and freedom of religion, that is becoming less and less the case. The Bible warns us the time is just ahead when NO MAN CAN WORK—in the Lord’s Work. We must sacrifice now as never before for this Work that we may FINISH the Work that Christ has called us to do. Pray as never before, for this Work. We are getting closer to that time. Governmental persecution will eventually stop the ‘short work’ (Romans 9:28) and lead to that ‘famine of the word’ (see also Preparing for the ‘Short Work’ and The Famine of the Word). In the future, when we teach the identity and plans of the final King of the North (Daniel 11:29-44), many will consider that to be a ‘conspiracy theory.’ And now, the USA is suggesting that freedom of speech does not include what it may consider to be conspiracy theories. The USA is going in the wrong direction. National repentance is the only way to prevent its destruction, and that does not look likely. Personal repentance, however, is still possible. If you are a North American, your personal future can still be much brighter than that of your country. The USA, along with Canada, will be destroyed (cf. Daniel 11:39; Habakkuk 2:6-8). There is a Place of Safety for the Philadelphians. Why it May Be Petra This article discusses a biblical ‘place of safety’ and includes quotes from the Bible and Herbert W. Armstrong on this subject–thus, there is a biblically supported alternative to the rapture theory. There is also a video on the subject: Might Petra be the Place of Safety? This entry was posted on Sunday, October 16th, 2016 at 7:10 am	and is filed under Prophecy.